In today’s post of a two-part series, I’ll share what gear I carry on my way to the crags. In the second part, I’ll share what I choose to take with me when I’m actually shooting on the ropes. I tend to use a matryoshka doll method when I travel with my gear. What I mean by that is that I take a larger bag, and inside that, I have one or smaller bags that I can use for different uses. These are the bags I use to shoot climbing and carry my S#&t around. This is the bag that serves as the master. I throw my climbing gear in here, water, food, as well as my smaller bag which containers my camera equipment. I like to think of this bag as my go anywhere do anything kind of pack. My camera, lenses, battery pack, and any supporting gear pretty much fits inside this bag. It is also the bag I choose to take with me as I ascend to keep everything organized, light, fast, and awesome. Note: TOPO Designs has updated this product. You can find the newer improved version here. 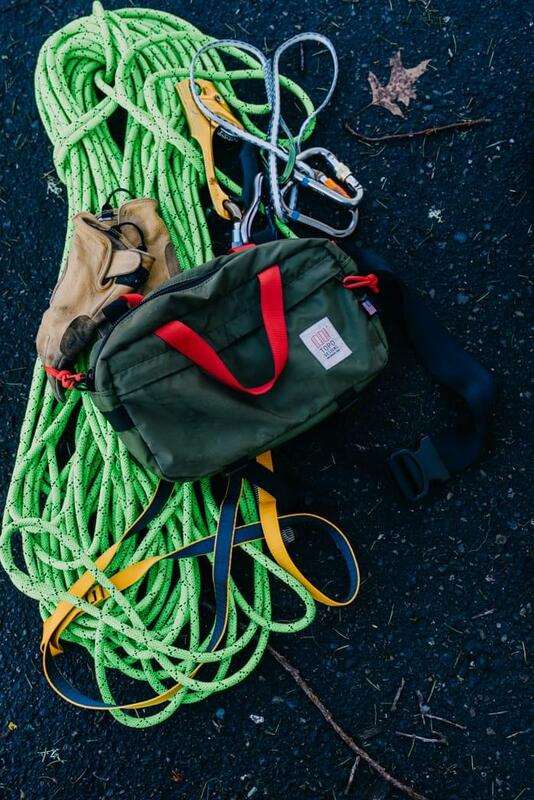 Here's the TOPO Designs Hip Pack chilling with climbing gear. Next, I load out the kit below every time I go out. Sometimes I pare down if I’m not shooting video, or only using a certain focal length. But this is the gear I use whenever I’m shooting climbing. Sony A7II Note: you can read more about my switch to Sony mirrorless cameras here. Create a plan, plan to create yo! Prioritize shots, locations, the who what where. Shout out to Access Fund (PNW Chapter. For the trail maintenance signs).